vegan chili has always been something i adore particularly in the cold winter months, but for some reason have never actually tried making from scratch. i'm not sure if i perceived it as being too complicated or hard to master, but after trying this really simple recipe, i'm regretting all these winters i have spent without it! it's simple and takes about 30 minutes from start to finish...and it is so filling and delicious. it's the kind of hearty food that warms you up from the inside. in a large bowl, combine flour, cornmeal, baking powder, sugar, and salt. add milk, oil, and eggs, stirring until smooth. pour batter onto hot waffle iron, and bake, in batches, according to manufacturer’s instructions. set aside and keep warm. in a large heavy pot, heat oil over medium-high. add onion and garlic; season with salt and pepper. cook until they beginning to soften, stirring occasionally (about 4 minutes). add zucchini, carrots, chili powder, and cumin. cook until carrots are crisp-tender (about 6 to 8 minutes). add beans, tomatoes, corn, TVP and 1 cup water. simmer until slightly thickened and carrots and TVP are soft, (about 8 to 10 minutes more). 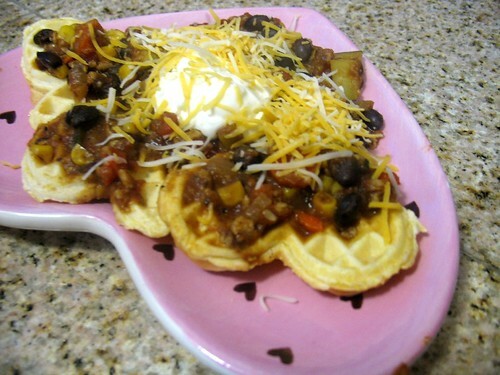 scoop chili on top of the waffles and garnish with your choice of toppings!